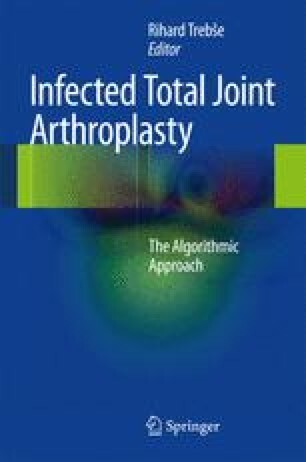 The possibility of differentiating an aseptic loosening from prosthetic joint infection (PJI) is rather difficult when clinical findings are poor or even absent but is very important since the treatments are different. Unfortunately, to date, there is no preoperative or intraoperative test that is 100 % sensitive and specific for diagnosis of prosthetic infection. Several authors proposed analysis of either frozen or permanent histological sections of periprosthetic tissue as a reliable method for PJI detection. Histological analysis using various criteria for the determination of “positivity” has been touted as a rapid and inexpensive test that has a high specificity; however, its sensitivity has been widely inconsistent ranging from 18 to 100 % in various studies. Histological analysis of periprosthetic tissue at joint revision surgery could be helpful when preoperative tests are ambiguous, but careful attention to the application of criteria for a histological diagnosis must be made to preclude diagnostic errors. Morawietz L, Tiddens O, Mueller M, et al. Twenty-three neutrophil granulocytes in 10 high-power fields is the best histopathological threshold to differentiate between aseptic and septic endoprosthesis loosening. Histopathology. 2009;847–853. doi: 10.1111/j.1365-2559.2009.03313.x.